What are the best longboards for heavy riders? We know that the market is full of choices, and that’s confusing than helpful. Isn’t it? There are so many types, construction and designs that might easily overwhelm beginners who have just started with their new hobby. For this reason, we’ve carefully selected the best longboards for all skill levels so that you can start comparing choices and buying the right one for you. Also in this guide, we’ve highlighted a section on the factors to consider when buying a longboard for heavy riders, and a few include wheels, bushings, trucks, bearings and deck materials. Keep reading and begin with the selection process later. 1 Longboard Weight Limit: How Much Weight Can a Longboard Hold? Longboard Weight Limit: How Much Weight Can a Longboard Hold? Longboards are sturdy and can accommodate a wide range of users of different heights and weights. However, they also have limitations just as a skateboard that can also has a maximum user weight limit. For big riders, their longboards are durable with very little or no flex at all, but that was history. Now, new materials have been introduced and longboard manufacturers have been trying to combine some of these materials for stability, ease of use and flexibility. But even so, weight capacities also vary from model to model and material to material. For example, riders who are at least 250 pounds should go for an average of 8-ply deck material. Deck made of bamboo and maple can offer flex and offer smooth riding for cruising and commuting. For people who are about 200lbs, they may want to go for deck made with fiberglass and bamboo, another alternative choice. So when trying to figure out how much weight can a longboard hold, you should check per model. As depending on their materials, their max user weight varies. Some can handle 250lbs, 275lbs or even 300lbs. Nevertheless, check the longboard you’re buying to get the most of your riding experience. 1. Sanview Bamboo Drop through Longboard 260 lbs. 42 Inch 1-ply bamboo, 7-ply Canadian maple 7" Aluminum Casting SHR78A 70x42 mm PU wheels 8.2 lbs. 2. Magneto Bamboo Longboard 275 lbs. 38.5 Inch 2-ply fiberglass and 3-ply bamboo Gravity Cast Aluminum SHR - High Rebound Urethane 6.5 lbs. 3. White Wave Bamboo Longboard 300 lbs. 36 Inch Bamboo and Canadian maple 180 mm aluminum trucks 70 x 50 mm Urethane wheels 9 lbs. 4. Atom Drop Through Longboard 275 lbs. 40 Inch Bamboo and maple Navigator Drone 70 mm Atom AREA 51 9.2 lbs. 5. Kahuna Creations Master-Crafted Longboard 260 lbs. 36 Inch 9-ply Canadian maple 180 mm trucks 82A Wheels 10 lbs. Who says big guys cannot ride longboards? 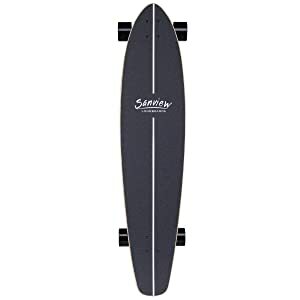 The Sanview Bamboo Longboard is ideal for bigger and taller riders because of its high quality materials, including 7-ply Canadian maple and 1-ply bamboo. It has good bamboo longboard deck with cool graphics carved for that added style. The deck is wide enough to accommodate taller and bigger riders that want to enjoy their ride to school, work or play. As it is also made with sturdy materials, riders won’t go wrong choosing the longboard that can give them the competitive edge on the road because it is a drop through type that can provide them with a smooth and easy ride. Its overall dimensions are 42” x 9.5” (LW), which is perfect for the big rider in you. The longboard ride is also stable because the gravity’s center is low (drop through). As you may know, stability is an important factor in riding especially for carving out hard turns, cruising and traveling. Regarding the wheels, they are made from PU materials, which are standard in many skateboards. They are top quality and offer high rebound for the big riders. The Sanview longboard also has topnotch 83A PU Bushings and 7” Aluminum Casting Trucks. These components make the longboard even more durable for the rider who want to use their skateboards on a daily. Another top feature of the bigger rider longboard is its bearings. They are accurate bearings rated nine on the ABEC scale and come with nylon ball cages. Top quality bearings steel also make them longer lasting. If you’re looking for cheap longboards, then you might want to check out this product as one of those to compare while looking around for the best longboard for heavy riders. The skateboard is perfect as a gift and is recommended for kids 9 and up. For parents aiming at making their kids active and keep them away from their mobile devices most of the time, they can consider getting them the affordable longboard. Overall, the longboard with cool graphics might be the ideal choice for those looking to start a new hobby in longboarding around the block, parks and zero traffic zones in their location. This longboard is flexible with its multiply maple and the bamboo deck is cold pressed for maximum durability and stability. When it comes to performance, it is perhaps the best longboard to consider for the bigger guys who would also love sliding with ease. 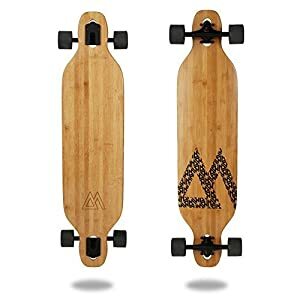 When looking for study bamboo decks and maple deck combination for a longboard, you may want to check out the Magneto bamboo longboards, which are chosen for freestyle, carving, dancing and downhill riding. 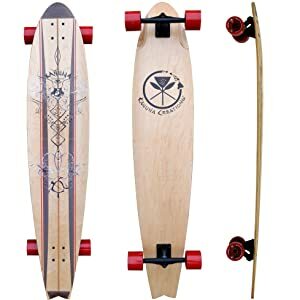 It is said to be the superior bamboo longboard for cruising the road because it features a drop through truck that gives a smooth ride and holds the gravity center. For riders and big guys looking for a flexible longboard, the Magneto longboard made of 38.5″ by 9″ may be what they’re looking for because it is also suitable for tight turns and carving. As it is of top quality materials, it can deliver that fun and smooth ride for many years to come. Around town, going to school, work, play, or simply spending time at the park, riders won’t have a hard time using their new grab and go transportation that keeps up with heavy demands and pressure. It is a good carving board that has a topnotch camber, offering enough support and flexibility. It also features high angle trucks that help in making tight turns. For the deck or board material, the Magneto longboard is a combination of fiberglass and 3-ply bamboo, making it one of the toughest longboard material combos around for that superb durability. The combination of bamboo and fiberglass also give this longboard a stylish finish that riders are going to be proud of all the time. Its deck shape is featuring a shallow concave design plus an arched camber. What do they do? The concave deck design gives a comfortable ride, and its camber makes the longboard more responsive. 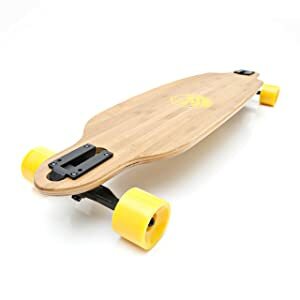 Heavy guys must really want to consider this Magneto longboard for these benefits that they might not be able to receive from other models on the market. For the trucks, they are made from Gravity Cast Aluminum that make them sturdy to last through the years, giving riders the most of their investment. They provide more stability in riding, cruising and carving. This board weighs only 6.5 lbs, giving riders an easier time of carrying it around with ease and convenience. Despite being lightweight, this product can accommodate big men of up to 275 lbs. For big riders that want to ride smoothly yet want a durable longboard, they may want to rely on the Magneto longboards that are also available at affordable prices. Overall, the Magneto longboard is a great choice for riders looking for a durable yet flexible board made of durable materials and has an excellent design. It weighs only 3.5 pounds, making it one of the lightest available on the market now. Even so, this product is stable and supportive for that smooth riding experience. It is also ideal for beginners, kids and teens who want to ride around the town or in parks. The White Wave Bamboo longboard has a user weight capacity of 300 lbs. This White Wave is only 39.5” x 5.2” x 10.9” in dimension. It has a wide enough base to accommodate larger and taller riders, making it one of the most versatile longboards for beginners. Plus, the model has a good length for a more controlled and stable ride. When it comes to longboards, the White Wave is one of those suitable for the purposes of swaying and cruising at top speeds without that resistance. The lightweight longboard won’t give riders a hard time carrying it in the back of their backpack when not in use because it is lightweight although not compact. Regarding engineering and design, this model has drop through trucks, which add to its better performance. This design offers superb stability when riding downhill fast. Even with sharp turns, heavy riders won’t have a hard time cruising with this longboard. When it comes to the complete longboards’ quality, the longboard offers maximum durability. This product is made with Canadian maple and bamboo. This combination gives a clear grip on the deck, so riders won’t have a hard time cruising or making even sharp turns. It has a concave designed deck that gives riders more comfort as it makes swaying and turning easier than using a flat longboard. Its deck is also about 40 inches, offering better support for downhill rides. The wheels of the longboard are high rebound urethane wheels, taking on some weight, but then are soft for gripping onto the ground. More downhill security is also offered by the 70mm wheels. When shopping around for longboards for heavier riders, users must look for one with high quality bearings. This model has the ABEC 9 Hellion bearing with built-in spacers. It is durable and strong enough to keep up with heavy demands. And for those who want a nice design and some added graphics, they will also love this longboard with yellow wheels and graphics. Overall, the larger rider looking for a fun and smooth ride might want to include the White Wave Bamboo Longboard in the selection process. It is tough and has a superb design that any user would appreciate to have and use for cruising down the streets. Heavy riders might want to opt for the Atom Drop through Longboard for its reliability and quality. First of all, this board has a great length of 40 inches, making it long enough for riding and making tight turns. The width and concave design of the deck also makes it a top choice among riders looking to get a superb riding experience. The Atom Drop through Longboard has a user weight capacity of 275 lbs. It is one of the longboards for big guys that are looking for longevity because it is made with bamboo and maple, making it a long lasting board through the years. Maybe many will ask of its flex and strength. That’s a good question because it is an essential factor when shopping around for a longboard. This model is made of 7-ply maple wood and two bamboo laminates. Maple makes the deck strong and the bamboo gives it flexibility. Cornering and maneuvering are two other important aspects of choosing a reliable longboard. And that is one advantage of this model. But since it comes with tight trucks out of the box, you must loosen them slightly to turn on corners. The parts of the Atom Drop through Longboard are replaceable with aftermarket ones. So for riders who want to customize the look and feel of their board, they can do so with this longboard. It is also one of those complete longboards that can support and stability for cruising and riding. Riders with big feet can also ride this longboard and experience ease and convenience in the process. The product also offers comfortable concave and a large deck not to mention the superb grip. 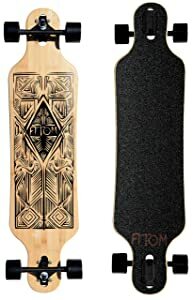 The Atom longboard has great styling and looks. It has interesting and attractive graphics that can make any rider look cooler. This longboard also has 78a soft-rated wheels and they are a bit large, absorbing shocks. The baseplate’s angle (trucks) to the board’s deck is 40 degrees, adding stability and support even when riding at top speeds or maneuvering in tough spots. It has an interesting design that is pleasing to the eyes and is lightweight. The board is also perfect for cruising and using to a wide range of purposes with some replacements of the trucks and longboard bearings. Wheel bite might be a minor issue. Kahuna is one of the dependable longboard brands known for designing and manufacturing top quality fun boards for kids and adults. Its max weight capacity is 260 lbs, making it ideal for heavy riders. When looking for longboards for heavy users, riders might want to opt for that with a drop for stability and support. This product has a two-inch drop, which can deliver the safest and lowest possible ride versus the road. It can also provide users with optimal control and an easy ride even for fat people because of its drop deck that’s two inches lowered. Another thing worth to mention are its high rebound wheels that can absorb much of the shock on the roads. When riding it, riders can feel as if they are one with the streets. Riders will also have the ultimate stability, safety and control due to the low gravity’s center. When it comes to the board’s front, it is wider at 10.5 inches, making it ideal even for heavier riders and it tapers towards the tail’s end. By using the longboard, you’ll gain more fun and comfortable riding experience. But aside from it, the longboard is also durable with Canadian maple plus silicon sand clear grip. This product also has 180mm Premium trucks as well as 70mm 82A Wheels. It also looks interesting and attractive with design and artwork by Su’a Sulu’ape FreeWind. For riders looking not just for a fun and smooth ride but also a cool longboard for fat guys, they may want to check out this beautiful creation. It is a premium quality longboard that is made in the USA. This Kahuna funboard is one of the best longboards for heavy riders around because it is flexible and reliable. It is not only fun and smooth to ride, but is also look stylish for its well thought of shape and design. The Kahuna longboard is an interesting and fun board that is also ideal as gift for kids and teens. It is also made of high quality materials, including its wheels, bearings and trucks. This product is also good for beginners who want to try a new hobby. 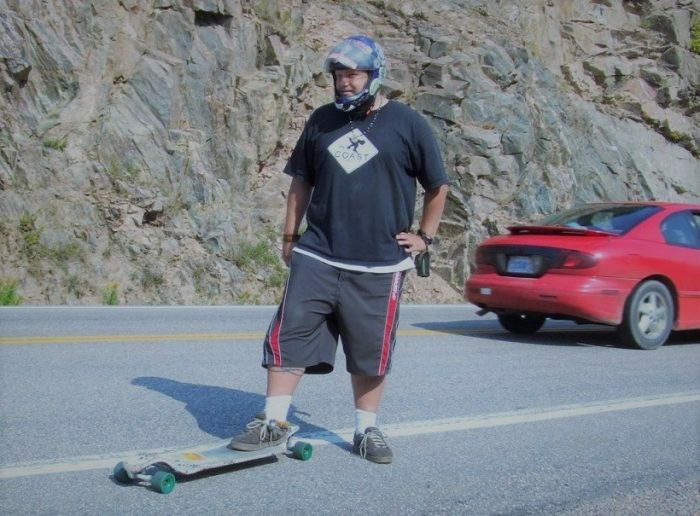 Definitely, the longboard for fat people is a decent choice for the money for its top features. Bearings can break over time. When shopping around for a longboard for 250 lbs, you should take into account certain considerations, aside from its plys of maple in the construction. In the following, let us touch on the most significant factors when looking for a big rider longboard. The best brands ensure of top quality materials, including the use of a Canadian maple deck, bamboo and fiberglass. They also know how to design and engineer their longboards to possess interesting graphics and many interesting features, such as a drop through deck. A few good brands are those highlighted in this review, including Kahuna Creations, Sanview, Magneto, Atom and White Wave. When looking for longboard deck for a big rider, riders must check on the sturdiness and flexibility of the materials. For example, good choices include those made from bamboo and maple wood or bamboo and fiberglass. Today, these are the best material combinations that ensure of topnotch construction and long lasting use. Makers have been using 8-ply or sometimes even 9-ply decks that offer great support for riders who are more than 250 pounds. Smoother riding experience can be provided by decks made of bamboo and maple because of some flex offered especially for cruising and commuting. On the other hand, big riders who weigh about 200 lbs can opt for fiberglass and bamboo combination. Finding longboard for 350 lbs, riders must also consider the trucks because they offer maneuverability, durability and stability. These parts must be durable and sturdy enough for handling the heavy weight that they’re supporting. In addition, these parts should be highly responsive and controllable so that the rider can make a turn without any hassle even at top momentum and speed. Heavier riders can provide that force for sufficient grip and smooth ride. The wheels that are attached to the board should be hard enough so that they won’t be compressed much by the weight of the rider. Also, the wheel grip should not be too much that it can make the ride unstable. When it comes to the wheel diameter, it must be between 70 and 75mm, the ideal diameter size for heavy riders. Then, riders should also check for the durometer, and that must be about 80a. The bushings are equally important, and they must be at least 90A+ for larger riders. For a more controllable and stable ride, bushings that have between three and six ratings in the wheels’ back can be considered. For a heavy rider, there is not much to look into the bearings. For the most part, larger users should just look into high quality and steel materials for the bearings. For a smooth riding experience, riders should also look into the bushings of the longboard that they’re buying. Heavy riders should not pick to soft ones, or they might risk injuring themselves or falling. They will also lose their board’s stability. So make sure to check the durometer value or the hardness of these components before getting a longboard. Users weighing at least 170 lbs should pick longboards with bushings rating of 93A. But for those looking for more flex in the setup of their board, they may want to go for 91A types or the 97a+ for those looking for a stiff ride. There you have the things to consider when finding a longboard for 300 lbs. Again, check on the components that must be suitable for heavy riders, and make sure that what you’ll buy will be able to keep up with your demands and purpose of using a longboard, such as cruising, carving, downhill, dancing and other types of riding. Nevertheless, pick one that will meet your riding needs and accommodate your height and weight. Riders and big guys can definitely ride longboards! Be ready to fly on the streets, have fun in the park or commute to school with convenience, ease and pleasure. Hope you find useful information on the top considerations to think about when buying a longboard for a fat rider. A few include the wheels, bushings, bearings, deck and trucks. Also when trying to compare, start with the list above for your reference on the best longboards for heavy riders. They are the top picked heavy guy longboards on the market now, so we tried reviewing them for your guidance, too, when buying your first longboard. Buy the best longboard for heavier guys today!